ORCA Grow Film â€“ Beware of Killer Yields! New reflective technology for hydroponic gardeners and indoor gardens. (a ray) is reflected into a single outgoing direction. light is reflected in a broad range of directions. Reflective foils have naturally smooth surfaces, even at the microscopic level, offering each individual ray of light the same surface orientation. As such, reflective foils are a natural specular reflective material. The microscopic geometry of ORCA Grow Film® microfiber and pore structure provides a rough surface, offering each individual ray of light a different surface orientation. As such, ORCA Grow Film® is a natural diffuse reflective material. 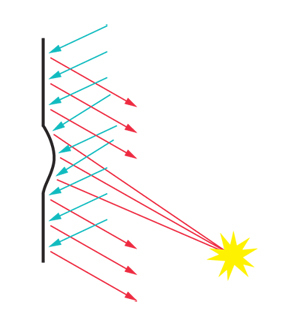 Hot spots or flash points occur when bundles of concentrated light rays which are traveling parallel to each other converge. In hydroponic grow rooms, the hot spot phenomenon is dramatically increased when using a material with a specular reflection as a supplementary lighting source to the grow lamps. A light beam can be thought of as a bundle of individual light rays which are traveling parallel to each other. Each individual light ray of the bundle follows the law of reflection. If the bundle of light rays are incident upon a smooth surface, then the light rays reflect and remain concentrated in a bundle upon leaving the surface. 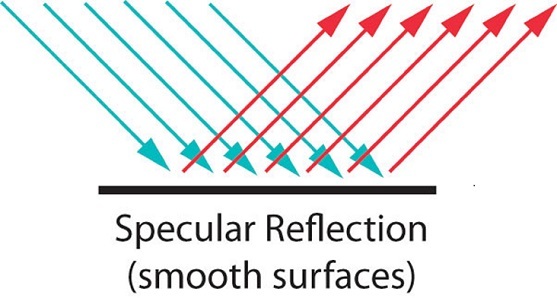 Changes in the orientation of a specular reflective surface, can cause concentrated light rays to converge together either on their first or subsequent bounces. Hot spots or flash points occur when the direction of these concentrated light rays converge together. In a grow room environment, orientation changes are commonly associated with corners and angles where walls, floors, and ceilings meet. Static objects in the grow room like duct work, equipment, tools, and planters can also contribute on subsequent bounces. Regardless of the grow room layout, the use of a specular reflective material on the walls, ceiling, and floors as a supplement lighting device to your grow lamps will be the biggest contributor to hot spots. Foils produce a specular reflection and therefore need to be hung on a wall with an absolutely flat/smooth orientation. Any creasing or ripples in the material either as a result of installation, or due to manufacturing imperfections, increase changes in the orientation of the specular reflection, causing the concentrated light rays to converge, thus promoting hot spots. On the other hand, if the surface is microscopically rough, the light rays will reflect and diffuse in many different directions. The microscopic geometry of the ORCA Grow Film® microfibers and pores means that each individual ray meets a surface which has a different orientation. The normal line at the point of incidence is different for different rays. Subsequently, when the individual rays reflect off the rough surface according to the law of reflection, they scatter in different directions. The result is that the rays of light are incident upon the surface in a concentrated bundle and are diffused upon reflection. Not only does a natural diffuse reflecting surface eliminate hot spots, you no longer need to worry about the product being installed on an absolutely flat/smooth orientation. The number and types of corners, angles, static objects found in your grow room layout may still reduce overall efficiency, but the efficiency will be greater because of the improved distribution from subsequent bounces off the reflecting surface. Less hotspots means more efficient utilization of your light. Some manufacturers attempt to reduce the specular nature of their foil and the resulting hot spots by embossing the foils surface. They “scratch” or “strike” the surface with a diamond pattern to create a surface that is partially rough. While this process creates a partial diffuse effect, it does not change the inherit specular nature of the material, the surface, or the resulting reflected light. Every gardener knows to use the right tool for the right job. Why would you consider using an underperforming specular foil, or one that has been “scratched” in attempt to act diffuse, when there is a high performance option with the natural diffuse reflection your plants desire? You no longer need to “foil” your grow room; advancements in technology have delivered the right tool. – ORCA Grow Film®.